If it weren't for the hard work of Katie Merrow, the Outstanding Women in Business Awards might not well exist today. NHBR was inspired to launch the awards in 2006 because of the early work of the New Hampshire Women's Policy Institute, which highlighted women's vital contributions to the state economy. As senior research associate at the New Hampshire Center for Public Policy Studies, Merrow helped to promote the findings of the institute's early research. She was then appointed the Women's Policy Institute's first executive director, and under her hand, it grew from startup to a respected source of unbiased data that informed public policy decisions on women's issues. 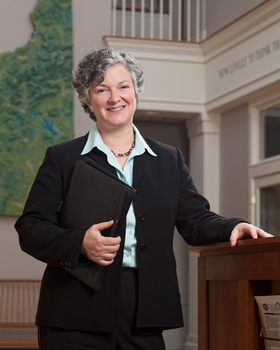 Today, Merrow works to support and develop the state's nonprofit sector as vice president of program at the New Hampshire Charitable Foundation, one of the largest community foundations in the country. She oversees 18 staff members and is responsible for about 4,500 grants and scholarships totaling $30 million annually. During her first year at the foundation, Merrow instituted measures to cut grant turnaround time in half and to use technology to cut costs and improve communications. This past year, Merrow led an effort to raise half a million dollars to launch a new computer platform to network and support nonprofits. Merrow was also instrumental in securing for the state a highly competitive grant and technical assistance that led to nationally recognized reforms in state corrections policy. As Helen Goodman wrote in her nomination, "Merrow brings a commitment to excellence and integrity to all that she does, and speaks her mind on issues important to improving the well-being of New Hampshire's communities." A. I started out at the State House in Massachusetts when I was 24, and really understood there the power for social good inherent in good public policy. I worked for state government in the early part of my career in Rhode Island and Massachusetts, and went on to get my MBA because I really felt the sector needed more people who understood finance and systems. I really built on that more in my work at the Center for Public Policy Studies and New Hampshire Women's Policy Institute, where I learned to use information to bring people to the table over an issue. A. There always challenges, and there are almost always opportunities in the challenges. In terms of New Hampshire, one of the greatest challenges in this post-recession is slowly coming out of it. There has been a real realignment of the public and private sector roles. There is a need for a re-engineering of doing business in the nonprofit sector to continue serving the community. That really calls for innovation and finding ways to support the people who are doing that. These are very challenging times for everybody. A. Probably my earliest inspiration came from my grandmothers. One was one of only two women to graduate from her graduating class at MIT, and worked as an engineer at General Electric in the 1920s — which was no mean feat, I'm sure. My other was one of the most industrious and creative homemakers I've ever known. A. I've really achieved balance by sequencing. I've done that with the help of an incredible and wisely supportive partner, my husband Jed. There were times I pulled out of the workforce and worked part time. It's not easy to make those transitions, but it is possible, and it can be done, and that's how I've done it. Women do it all kinds of ways. A. Figure out what you're good at, then work to get better at it, then find a way to use that to help your community. Trust your gut and ask for help when you need it. It's one of the most empowering things you can do.